JS series of concrete mixer is a double horizontal shaft forced mixer, this small concrete mixer machine has the advantages of single machine independent operation and simple concrete mixing station with PLD series, but also for the mixing station to provide supporting the host, for all kinds of large, Small and medium-sized prefabricated components factory and roads, bridges, water conservancy, wharf and other industrial and civil construction projects, can be mixed dry hard concrete, plastic concrete, mobile concrete, lightweight aggregate concrete and a variety of mortar, is a high efficiency machine Type, the application is very extensive. 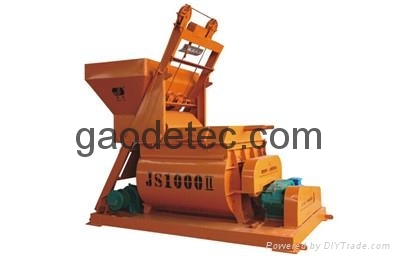 The series of mixer machine design structure is reasonable, the layout of new, easy to use and maintenance. The height of the leg is designed as follows: JS500 equip with 1500mm, JS750 equips with 1600mm, JS1000 equips with 2700mm and 3800mm. Users can use the anti-bucket car, dump truck, mixer use, but also according to the special requirements of the user restructuring to meet the needs of users. If you want to know more about JS series of concrete mixer machine, please feel free to contact us.